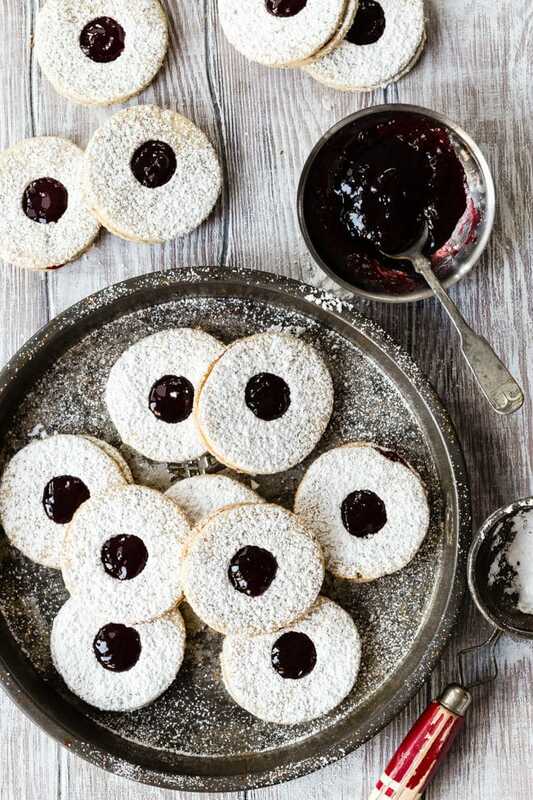 These easy Linzer Cookies are a fruity, European alternative to your everyday sandwich cookie. 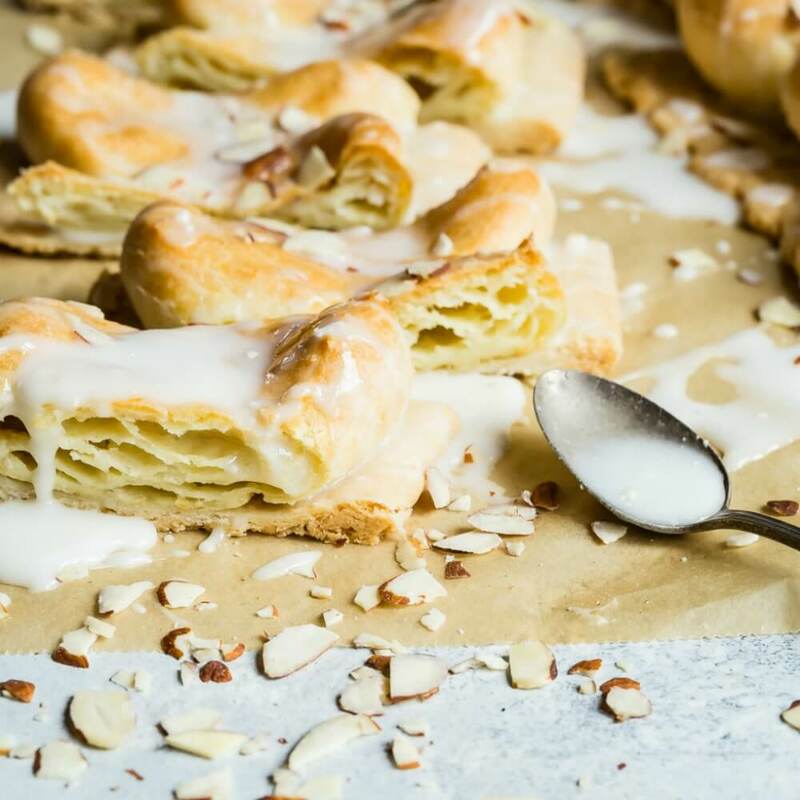 Start with buttery pastry dough flavored with ground almonds, then top with a simple yet sweet raspberry jam. They taste even better than they sound! Austrian Linzer cookie dough needs to chill for at least an hour, so I usually make the dough the night before. In the morning, I preheat the oven and start rolling out my dough. I used ground almonds in this recipe, but hazelnuts and walnuts are other good choices. I used a seedless raspberry jam for the filling, but currant, plum, and apricot jams are also popular. 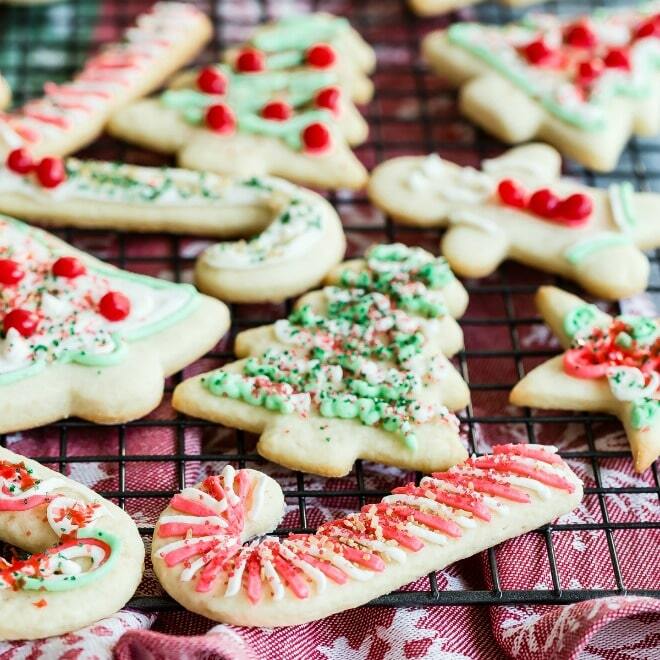 The number of cookies you end up with will really depend on the size of your cookie cutters. 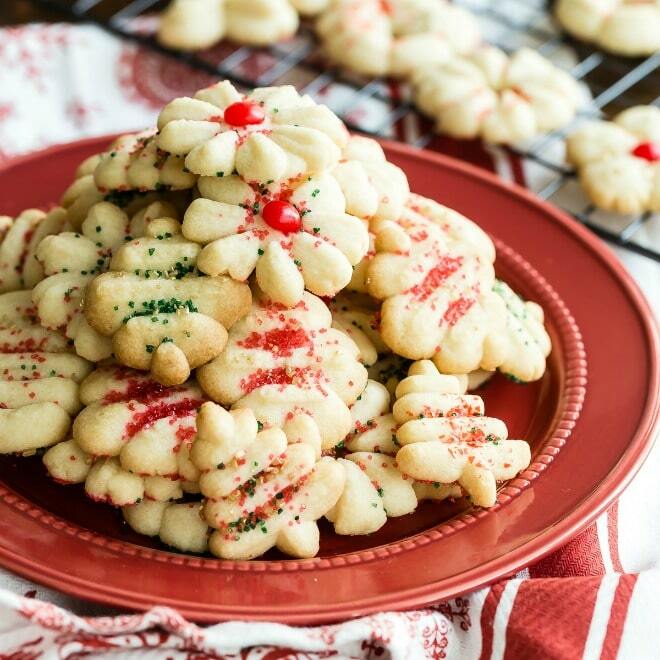 I suggest a 2″ to 3″ cookie cutter which should yield about 24 cookie halves or 12 sandwich cookies. I have made them with larger cookie cutters and then I had about 8 sandwich cookies when all was said and done. 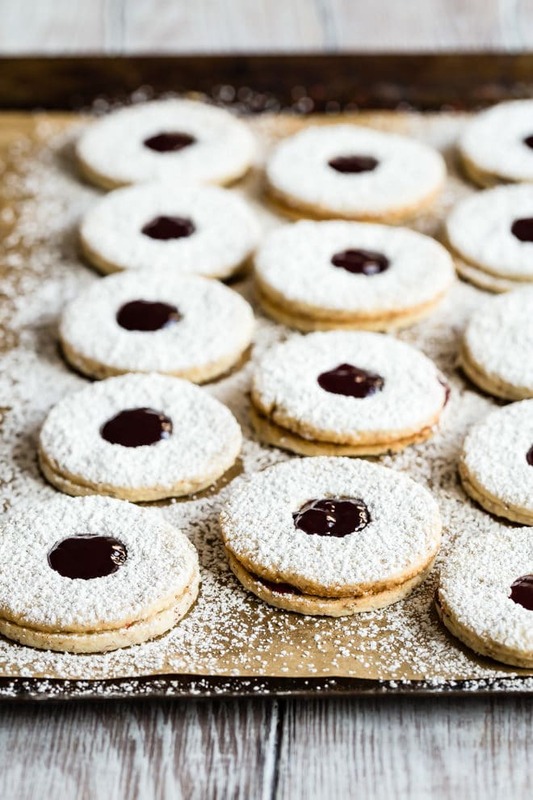 Because the original Linzer Torte was covered in lattice strips, almond Linzer cookies are often cut with decorative cutters that also have a lattice edge. Or, try something fun and unexpected like these heart-shaped Linzer cookies! 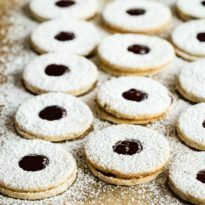 Save these Linzer Cookies to your “Cookies” Pinterest board! An easy recipe for crisp, buttery Linzer Cookies. 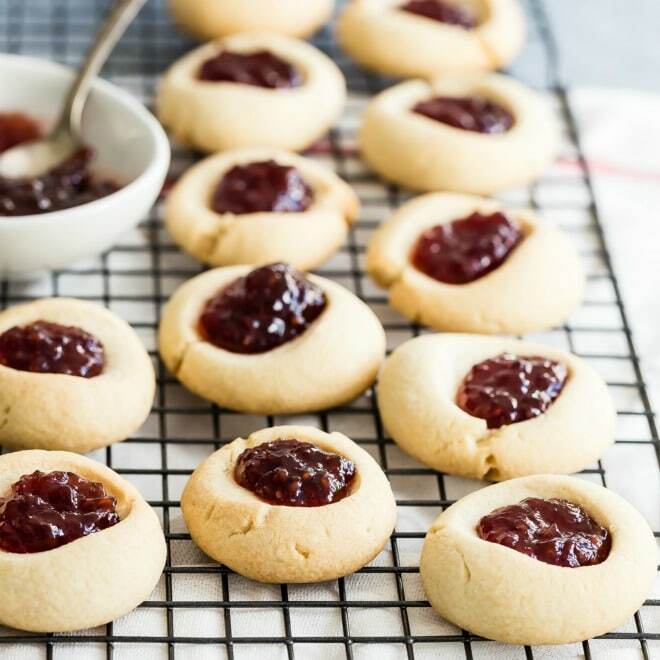 With almonds in the dough and a sweet raspberry filling, you'll love how delicious these cookies are! In a food processor or grinder; process the hazelnuts or almonds using short pulses until finely ground. Set aside. 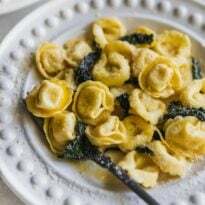 In a small bowl, whisk together flour and salt. In a standing mixer with the paddle attachment on high speed, or with an electric mixer, beat butter until pale and fluffy. Add sugar and continue to beat until well combined. Beat in egg yolk, vanilla, and ground almonds. Reduce speed to low. Add flour and salt mixture and beat until just combined. Turn out the dough on to a floured surface and divide into two portions. 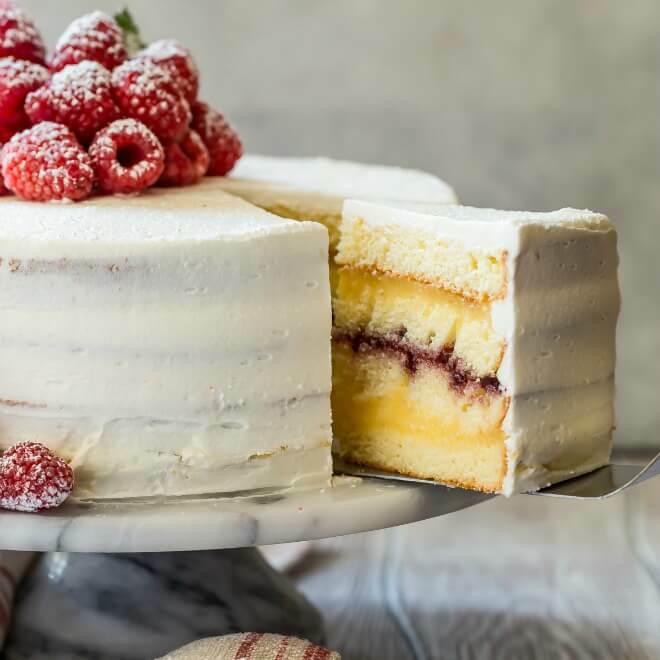 Wrap each portion in plastic wrap and refrigerate until chilled, at least one hour. Preheat the oven to 350 degrees. Line 2 baking sheets with parchment paper or silicone baking mats. Remove one portion of dough from the refrigerator (keep the other one chilled). Roll out between two pieces of parchment paper or wax paper to a thickness of 1/4-inch. Using a cookie cutter 2 to 3 inches in diameter, cut out cookies. In half of the cookies, cut a hole in the center 1 to 1 1/2 inches in diameter and remove. Repeat with remaining portion of dough and any remaining scraps. If the dough becomes soft or sticky, chill in the refrigerator for another 10 minutes. You should have about 24 cookies total, half with holes cut in the middle. Carefully transfer the cookies to prepared baking sheets using an offset spatula. Bake about 12 minutes or until lightly golden around the edges and firm. Loosen the cookies on the baking sheets but do not remove until completely cooled. To assemble the cookies, spread the bottom halves (no holes) with a thin layer of raspberry jam. Top with cut-out tops. Spoon more jam to fill the cut-out holes and dust with powdered sugar. To toast the nuts, preheat oven to 325 degrees. Spread the nuts on a rimmed baking sheet in a single layer. Toast in the oven until fragrant and the papery skin starts to crack, stirring occasionally, 10 to 20 minutes. The exact time depends on the size of the nuts. Start checking after 10 minutes and immediately remove from baking sheet. To remove skins from hazelnuts (if applicable), rub the nuts in a clean kitchen towel immediately after they come out of the oven, while they're still warm. Am I correct in assuming that the ground nuts are to be mixed with the flour and salt? That’s not clear in the directions. Hi Yvonne, sorry about that. The recipe was a little messy – I also found a typo where it said “reduce heat to low” and should have been “reduce speed to low.” The ground almonds should be added with the egg yolk and vanilla. It’s fixed now and I’m really sorry about that! Thanks for your patience with me. Take care! Love linzer cookies! I was actually thinking about trying to make these cookies with gingerbread! 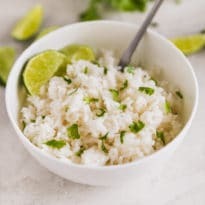 Hi Darice, I’m so sorry this wasn’t listed in the recipe card! I’m fixing it now. This recipe makes 12 sandwich cookies (so 24 halves). Thanks for the question and I hope you have a great holiday!